Yamaha Motor India Sales Pvt. Ltd., today launched two new models to comprise its very successful FZ Series. The new models FZ Version 2.0 and FZ-S Version 2.0 are mounted with a newly designed air-cooled 149cc 4-stroke, SOHC, single-cylinder fuel-injected engine on a lightweight frame to realize the product concept of a “Sharpened & Power-packed New FZ.” With the launch of these new models targeted at young men between the ages of 18-30, the company hopes to see a steep growth in the customer base, especially keeping in mind the mileage conscious target audience. The eagerly-anticipated launch took place today at J W Marriott Hotel, New Delhi as Bollywood heartthrob John Abraham unveiled the new models to public applause and delight. The new FZ Version 2.0 and FZ-S Version 2.0 will be available in the market beginning July 2014. The FZ Series motorcycles were first introduced in 2008 and went on to win a following primarily among trend-conscious young men. The features that make the FZ models so popular are its outstanding acceleration in city riding and its distinctive styling and design. (2) Fuel injection and light weight (lightest in 150cc class) to enhance engine performance (3)Newly Designed Tandem Seat & Grab bar for good rider comfort (4) Multi-function instrument panel featuring an “ECO Indicator” that lights up when the machine is ridden in an eco-friendly manner (5) New front and rear suspension settings (6) New Chassis-related changes for a light, agile ride (7) New Front and Rear tires for improved handling stability. The new FZ models possess a design that reflects Yamaha’s philosophy of ‘Refined Dynamism’ that is meant to captivate users and help create vibrant lifestyles through unparalleled beauty and dynamism. There were individual colouring concepts set for the FZ and FZ-S. For the FZ, the colours were chosen based upon the concept of ‘Simple, Stylish and Sporty’. The colouring concept for the FZ-S was ‘Street, Cyber and Sporty’, designed to project a high-tech image by creating an effect that makes it seem as if the body is emitting sharp fluorescent light. Welcome to the June Edition of the UK Science and Innovation Network in India’s Newsletter. 14th July 2014 is the deadline for nominations for this year’s Queen Elizabeth Prize for Engineering. India is well represented in the Prize architecture – Narayana Murthy is on the judging panel and Dr Baldev Raj is on the search group. You can read about Dr Baldev thoughts on engineering in a recent interview about the prize. The 2013 winners were rewarded for the creation of the World Wide Web. June also saw Antimicrobial Resistance announced as the chosen challenge for the recently reanimated £10m Longitude Prize. It was originally established in 1714 to reward the invention of a simple way of measuring longitude and awarded to John Harrison some 50 years later. This time around the British public were invited to vote for their favoured challenge, the prize criteria will now be refined in order to reward the creation of a cost-effective, accurate, rapid and easy-to-use test for bacterial infections. 3D printing – the future of manufacturing? French FM Laurent Fabius says indo-french relnship is about 2words :”trust and partnership” France is pleased to receive increasing number of Indian students- Laurent Fabius, French foreign Minister.We count on PM Modi’s strong leadership- Laurent Fabius, French Foreign Minister. 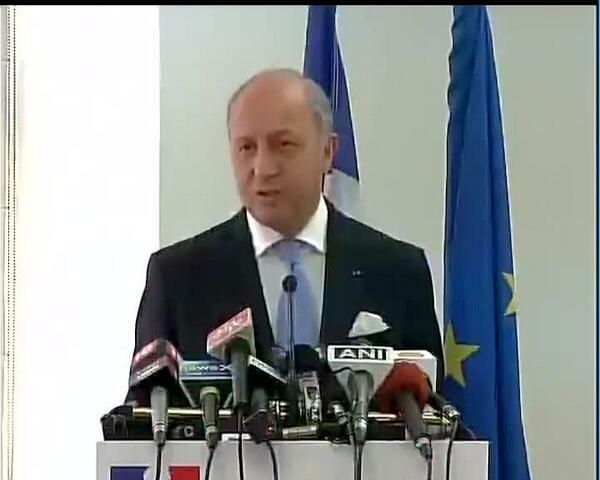 France will be proposing a credit line of 1 billion euros for sustainable infrastructure and urban dev in India- Laurent Fabius further added India wants to share and wish to have the best technology,complete independence, continuity and to ensure technology transfer.This partnership needs to grow particularly in economic area. The situation in Iraq is very very worrisome and this for the first time a terrorist group is in a position to take over the whole country with enormous consequences.We are opposing terrorist groups everywhere.India have to cooperate in fighting against these terrorist groups.We are very clear that all of democratic nations must make the utmost efforts that no resource is given to terrorist groups. 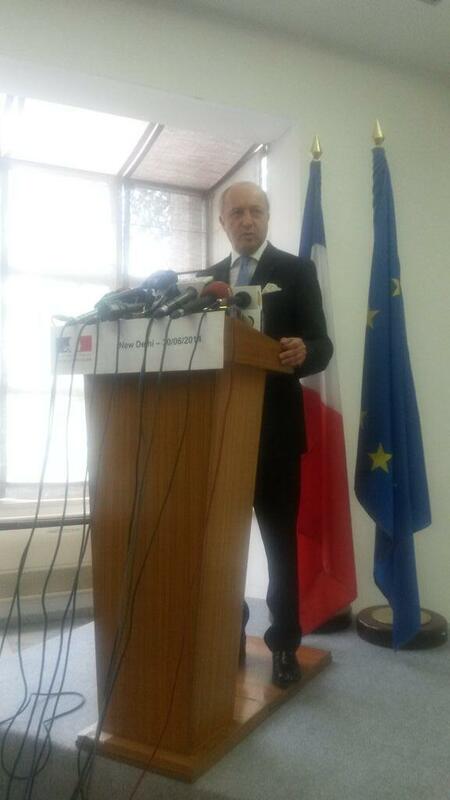 FM Fabius says Assad is in cahoots with ISIL. And terrorists in Libya Nigeria and Mali are connected too. West Bengal Governor MK Narayanan tendered his resignation on Monday. Speaking to Tel Aviv University’s INSS think-tank, Netanyahu described the situation in Iraq and the Middle East in general as a “collapse,” due to strife between Sunni and Shiite Muslims. Amid the recent insurgency of the Islamic State in Iraq and the Levant (ISIS/ISIL) militants, Kurds have seized the opportunity to bring a long-sought independent state of Kurdistan closer to reality. Kurdish Peshmerga armed forces have been guarding their provincial borders from ISIS, but also seized the contested Iraqi city of Kirkuk, proclaiming it part of their territory. A fighter of the Islamic State of Iraq and the Levant (ISIL) holds an ISIL flag and a weapon on a street in the city of Mosul. ISIS announced that it should now be called ‘The Islamic State’ and declared its chief, Abu Bakr al-Baghdadi, as “the caliph” of the new state and “leader for Muslims everywhere,” the radical Sunni militant group said in an audio recording distributed online on Sunday.This is the first time since the fall of the Ottoman Empire in 1923 that a Caliph – which means a political successor to Prophet Muhammad – has been declared. The decision was made following the group’s Shura Council meeting on Sunday, according to ISIS spokesman Abu Mohammed al-Adnani. Air India on Sunday kept three planes on standby for evacuation of Indian nationals in strife-torn Iraq even as the Government reviewed the situation in the region at a high-level meeting after which it said the 39 abducted Indians were safe. The government also said that it was in touch with the 46 Indian nurses stranded in the militant stronghold of Tikrit and that they were unharmed.External Affairs Minister Sushma Swaraj chaired a meeting of Indian envoys to the Gulf countries to chalk out future strategy for safety and evacuation of nationals in Iraq. There are an estimated 10,000 Indian nationals in that country. The Spokesman of the Ministry of External Affairs said there were around 150 Indians in the zone of conflict and about 50 of them have left. “As of now in the zone of conflict, they are less than 100,” the spokesperson said. The Government also decided to transfer part of welfare funds in the Indian missions in Gulf countries to its embassy in Baghdad to be used for helping Indians to facilitate the departure of its nationals. Official sources said three Air India planes are on standby and ready to leave for Iraq at short notice to bring back the nationals. The state-owned airline is fully geared for the evacuation drill, the sources added. The family members of the kidnapped Indian nationals also met Swaraj who assured them that the government was taking all steps for the safety and evacuation of their kith and kin. He said the Indian nurses in Tikrit “remain concerned because of noises and fighting are going on in surrounding area but as of now they remain safe”. “We are in contact with them,” he said. “My understanding …as of now is that we have been in touch with the nurses just a few hours ago. Also they remain unhurt. Their hospital has not been intruded upon,” he added. The spokesperson said the government was in touch with the Indian nationals in Iraq. “At this stage …we are working with them and their companies as well as those agents who have sent them come here to Iraq to bring them back by commercial flights. This initial phase will begin by tomorrow or latest by flight availability. This is a national endeavour,” the spokesperson added. This is a “global endorsement of India’s space capability”, said Prime Minister Narendra Modi after the successful launch of PSLV C23 that carried five foreign satellites. “I feel specially privileged to witness this event in person,” said Modi who clapped as the Polar Satellite Launch Vehicle-C23 (PSLV-C23) – standing around 44.4 metres tall and weighing around 230 ton – tore into the bright morning skies with orange flames fiercely burning at its tail. The rocket’s main luggage is the 714 kg French earth observation satellite SPOT-7. Piggybacking on the main luggage are the four small satellites viz: 14-kg AISAT of Germany; NLS7.1 (CAN-X4) and NLS7.2 (CAN-X5) from Canada each weighing 15 kg; and the 7-kg VELOX-1 of Singapore. He described it as “global endorsement of India’s space capability”. The cost of sending an Indian rocket to space is less than the money invested to make the Hollywood film “Gravity”, Prime Minister Narendra Modi said. “I have heard about the movie ‘Gravity’…the cost of sending the Indian rocket to space is less than the money invested to make the movie,” said Modi after the successful launch of a rocket that carried five foreign satellites to space. “Gravity” is a 2013 British-American 3D epic science fiction thriller film. It was directed by Alfonso Cuarón, and stars Sandra Bullock and George Clooney as astronauts involved in the mid-orbit destruction of a space shuttle and their attempt to return to Earth. The budget of the movie was $100 million. Proposing satellite diplomacy with a view to playing a key role in the development of the region, Prime Minister Narendra Modi asked Indian space agency ISRO to develop a SAARC satellite which can be dedicated as a ‘gift’ to the neighbours. “Today I ask you, the space community, to take up the challenge of developing a SAARC satellite that we can dedicate to our neighbourhood as a gift from India,” he said in his address after witnessing the successful launch of five foreign satellites from here on board ISRO’s PSLV C-23 rocket. He asked the scientists to work on a satellite that would provide full range of applications and services to all of India’s neighbours. “Such a satellite will be helpful in SAARC nations’ fight against poverty and illiteracy, the challenge to progress in scientific field, and will open up avenues to provide opportunities to the youth of SAARC countries,” he said from ISRO’s Mission Control Room. The ‘dream’ for such a satellite will be useful for the development of all SAARC nations with India playing a key role in that, Modi reasoned in a speech laced with anecdotes and delivered in a mix of English and Hindi. Modi said the need for such a satellite arose because of India’s age-old ethos of ‘vasudhaiva kutumbakam’ (the world is a family) even as “India’s space programme is driven by service and not by desire of power”. “For us, it (space programme) is an important instrument of human progress. We must, therefore, share the fruits of technological advancement with those who do not enjoy it. We already share disaster management data with over 30 countries. “We provide benefits of telemedicine to Afghanistan and African countries. But we must do more. ‘Yeh dil maange more’ (the heart desires for more),” Modi said repeating a famous tagline. He also exhorted the scientific community to enlarge India’s footprints of satellite navigation system to cover all of South Asia. Space programme was one area where India had “pushed beyond mediocrity” to achieve excellence despite “international hurdles” even as the country had come a long way from its humble beginnings of its first satellite Aryabhatta to engaging in commercial launches of satellites of even developed countries, he said. Crediting former Prime Minister A B Vajpayee’s vision for India’s lunar mission Chandrayaan, Modi also referred to the Mars mission, adding, he followed the space-related developments closely. Modi said that space technology was not confined to the elite and described this as ‘wrong perception’ even as he outlined the government’s commitment to change it. He said that the laboratory achievements of the scientists will be implemented for public good and noted that GIS-enabled watershed programmes, besides others, had borne fruits for the common man. The Prime Minister asked the space scientists to work towards replicating such models in the area of land records and related issues, besides governance, and said if implemented, it could help the public at large. India and China on Monday signed three key MoUs, including one on industrial parks and flood data of Brahmaputra river, coinciding with the China visit of Vice President Hamid Ansari. The agreements were signed in the presence of Ansari and his Chinese counterpart Li Yuanchao after their talks.The MoU on industrial parks is aimed at attracting Chinese investments in India and provides an enabling framework for Chinese companies to invest in industrial parks and zones. Under the MoU, the two countries have agreed to cooperate to increase mutual investment in each other’s economies and this cooperation will be in accordance with the relevant domestic laws and regulations of each party and on the basis of equality and mutual benefit. An Industrial Park Cooperation Working Group made up of equal number of representatives from both the countries will be set up to identify and agree upon the detailed modalities for implementing cooperation under this agreement and will periodically review the progress, an official statement said. The MoU on flood data sharing will provide India with 15 days more of hydrological data of river Brahmaputra. The data helps India in flood forecasting. India provides money for maintenance of three hydrological centres on the Chinese side. The data will be provided from May 15 to October 15 each year. The third MoU will help the two countries establish a framework for regular interactions between administrative officials to share experiences and learn from each other’s best practices. Specific programmes of cooperation will be worked out subsequently. The MoU will ensure cooperation between Lal Bahadur Shastri National Academy of Administration, Mussoorie and China Executive Leadership Academy, Pudong, Shanghai. The MOU envisages exchange of officials, cooperation in developing training programmes, field visits to each others countries. Both the Netherlands and 10-men Costa Rica reached the World Cup quarterfinals in a way that stunned the football world. Costa Rica, known as the Ticos, were 5 on 5 in penalty kick while Greek veteran striker Theofanis Gekas’s fourth round effort was denied by keeper Keilor Navas.The first half was dull and slow and full of turnovers with lackluster performance from both sides. The Arena Pemambuco was surrounded by boos from the stands, when the referee Benjamin Willianms blew the whistle to end the first half. But the second was filled with drama. The Ticos skipper Bryan Ruiz met a low cross from Christian Bolanos at the edge of the box in the 52nd minute. The 28-year-old, who was on loan in PSV Eindhoven from English Championship club Fulham, failed to shoot with his full strength but the ball simply dribbled into the side netting with Greek keeper Orestis Karnezis misjudging the trajectory of the ball and not making a save. The Ticos were reduced to ten men in the 66th minute. Defender Oscar Duarte received his second booking of the match after a careless tackle on Cholevas.Costa Rica were under great pressure for the following 30 minutes. And the Greeks managed to score in injury time again.Central defender Sokratis Papastathopoulos from Bundesliga club Borussia Dortmund, who stayed up front after a late run into the box, nodded down a lofted ball to second half substitute Gekas. The latter’s powerful shot was denied by Navas but Papastathopoulos followed up and lashed home the rebounded ball.The Greeks could have finished the match in regular time but Konstantinos Mitroglou’s header from close range was palmed away by Navas.After the 90-minute of play ended at 1-1, neither team managed to score again in extra time and had to decide the match through penalty kick. The 26-year-old Mitroglou missed another chance in the dying minutes of the extra time as his close range snap shot was again stopped by Navas. 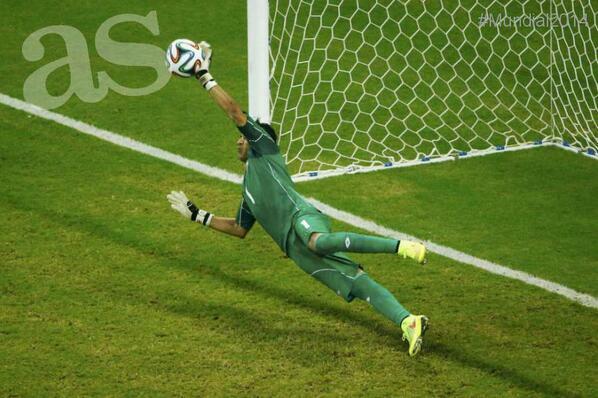 Costa Rica will face the Netherlands for a semifinal berth Saturday. Prime Minister Narendra Modi on Friday said the strategic and global partnership with Japan is a high priority for India and he was attaching great importance to his visit there which has been put off till after the budget session of Parliament ending 14th August. Receiving a Japanese Parliamentary delegation at his residence here, Modi said India and Japan share the “fundamental identity of values, interests and priorities”.This was Modi’s first meeting with Japanese political leaders after assuming office of the Prime Minister. For India, the strategic and global partnership with Japan has high priority, the Prime Minister told the delegation. He said though he attached great importance to his visit to Japan, which was originally scheduled in the first week of July, he had to defer it in view of the budget session of parliament, the new government’s first. Modi has decided to postpone the visit till after the budget session which ends on August 14. He has already written a letter to his counterpart Shinzo Abe in this regard. Talking about the bilateral relationship, Modi said apart from economic ties, India and Japan share strong Buddhist cultural linkages, according to a PMO statement. Modi, the former Chief Minister of Gujarat, noted that Japan has been a partner country for the ‘Vibrant Gujarat’ meet initiated during his tenure in the state. Leader of the visiting delegation Ichiro Aisawa said Japanese nationals working in India have great expectations from Modi’s government. He added the people of India also hoped that the new government will take the Indian economy to new heights. Responding, the Prime Minister said his government had been elected with a mandate to make India strong and prosperous and the government would do its best to fulfill that mandate. He underlined that an economically vibrant and strong India was in the interest of the entire Asian continent. The Japanese delegation suggested parliamentary exchanges between the two countries, which was welcomed by the Prime Minister. Prime Minister, Shri Narendra Modi, today witnessed the successful launch of the Polar Satellite Launch Vehicle – PSLV-C23 from Sriharikota. In his congratulatory address at the Mission Control Centre after the landmark launch, the Prime Minister called upon the space community to proactively engage with all stakeholders to maximize the use of space science in governance and development. India must fully harness this expertise in space technology in the developmental process for social change, economic development and resource conservation, he added. Speaking of India’s age-old ethos of the whole world being one family, the Prime Minister said India’s space programme is driven by a vision of service to humanity, not a desire of power. He said India has a rich heritage of science and technology, including space. Shri Modi said the works of our ancestors, who included visionaries like Bhaskaracharya and Aryabhata, still continue to inspire generations of scientists. He added that India must share the fruits of its advancement in space technology with the developing world, and neighbours in particular. He called upon the space community to take up the challenge of developing a SAARC satellite that can be dedicated to our neighbourhood as a gift from India. Shri Modi said we can be proud of the Indian space programme, which is fully indigenous, developed in the face of great international pressure and hurdles. He described it as a domain where “we have pushed beyond mediocrity to achieve excellence.” He said the moon mission was inspired by the vision of former Prime Minister, Shri Atal Bihari Vajpayee. Among ongoing projects, Shri Modi referred to the Mars Mission, and the satellite-based navigation system. Referring to the benefits of space technology for the common man, the Prime Minister said it drives modern communication, empowers children in remote villages with quality education, and ensures quality healthcare to all, through telemedicine. He said it has a critical role in realizing the vision of a Digital India – the power of 125 crore connected Indians. The Prime Minister said continued progress in space must remain a mission of high priority. He called for developing more advanced satellites and expanding our satellite footprint. He said India has the potential to be the launch service provider of the world and must work towards this goal. The Prime Minister called for involving India’s youth with space. Shri Modi said he was pleased to have met the young scientists as Sriharikota, and admired their work and their achievements. He commended Dr. K. Radhakrishnan for his leadership, and said India’s space programme is the best example of his vision of scale, speed and skill. He wished the team of scientists the best as they prepare to insert our spacecraft into the orbit of Mars in a few months. In a speech made in a combination of English and Hindi, Shri Modi spoke of the Tapasya made by generations of scientists, in a long journey from Upanishad to Upagrah. He remarked that he had met four generations of scientists during his visit to ISRO. Andhra Pradesh Governor Shri Narasimhan, Andhra Pradesh Chief Minister Shri Chandrababu Naidu, Minister of Parliamentary Affairs Shri Venkaiah Naidu, MoS, PMO Dr. Jitendra Singh, Secretary Space Dr. Radhakrishnan, and eminent scientists Prof U R Rao, Dr. Kasturirangan were present on the occasion. The agreements were signed in the presence of Ansari and his Chinese counterpart Li Yuanchao after their talks. The MoU on industrial parks is aimed at attracting Chinese investments in India and provides an enabling framework for Chinese companies to invest in industrial parks and zones. You are invited at the following Discussion at India Habitat Centre. We would be obliged if you forward the invitation to the interested professionals. Another historic event for India in its contribution to space technology. Indian government making it both business and achievements for its own growth in telecommunication field out of this marvel technology contributed by our able scientist is matter of pride. PSLV C23 carrying French Earth Observation Satellite SPOT-7 and four co-passenger spacecrafts from Singapore, Canada and Germany was successfully launched from Sriharikota in Andhra Pradesh and Prime Minister Narendra Modi, witnessed the historic moment. After a perfect lift off from the First Launch Pad in Satish Dhawan Space Centre here at 9.52 AM witnessed by Modi, Indian Space Research Organisation’s workhorse Polar Satellite Launch Vehicle PSLV-C23 placed all five satellites into their intended orbits, one after the other between 17 and 19 minutes after liftoff, in textbook precision.Though the Mission Readiness Review Committee and Launch Authorisation Board had on Friday cleared the launch, the launch time was rescheduled to 9.52 AM Monday, a delay of three minutes, attributed to “probable space debris” coming in the rocket’s way. Besides its primary payload of 714 kg French Earth Observation Satellite SPOT-7, PSLV C23 carried and placed in orbit 14 kg AISAT of Germany, NLS7.1 (CAN-X4) and NLS7.2 (CAN-X5) of Canada each weighing 15 kg and the 7 kg VELOX-1 of Singapore. In his first official visit to this spaceport, Modi asked the space community to develop a SAARC satelite even as he heaped praise on Indian space scientists, recalling their contributions from the early days. He referred to pictures showing rocket components being transported on bicycles. A visibly elated Modi, who said it was a ‘privilege’ to witness the event, congratulated “our brilliant space scientists for a successful launch”. “This fills every Indian’s heart with pride and I can see the joy reflected on your face,” he said from the Mission Control Room, adding Monday’s successful launch of foreign satellites was a “global endorsement of India’s space capbility”. Besides Modi, Andhra Pradesh Chief Minister N Chandrababu Naidu, Andhra Pradesh Governor E S L Narasimhan and Union Minister M Venkaiah Naidu also witnessed the launch from the Sriharikota spaceport, about 100 kilometres from Chennai. The Prime Minister arrived in Chennai on Sunday enroute to Sriharikota to witness the event. French satellite SPOT 7, identical to SPOT-6, which ISRO had launched in 2012, would be placed diametrically opposite to SPOT-6, forming part of the existing Earth observation satellite. European space technology company Airbus Defence and Space has built SPOT-7. Germany’s AISAT satellite would focus on the global sea-traffic monitoring system with special emphasis on high traffic zones using AIS signals. It is also Germany’s first DLR satellite in the nano-satellite class. NLS 7.1 and NLS 7.2 are from the University of Toronto, Institute of Aerospace Studies/ Space Flight Laboratory in Canada. Both payloads would perform Two-spacecraft precision formation flying using differential GPS with centimetre-level relative position and sub-metre level accurate position control system. Satellite VELOX-1 from Nanyang Technological University, Singapore is a technology demonstrator for in-house design of image sensor, MEMS-based attitude determination and control system and inter-satellite RF link. The five satellites were launched under commercial arrangements that ANTRIX (ISRO’s commercial arm) entered into with the respective foreign agencies. ISRO has so far launched 35 satellites from 19 countries around the globe — Algeria, Argentina, Austria, Belgium, Canada, Denmark, France, Germany, Indonesia, Israel, Italy, Japan, Korea, Luxembourg, Singapore, Switzerland, The Netherlands, Turkey and United Kingdom, bringing a huge sum to the country as foreign exchange. India began its space journey in 1975 with the launch of Aryabhatta using a Russian rocket and till date, it has completed over 100 space missions including missions to moon and mars. The Centre For Policy Analysis is organizing a national convention IDEA OF INDIA at the Constitution club(Speakers hall) on 4th July and at India International Centre (Kamladevi Block) on 5th July 2014. A line in confirmation will be deeply appreciated.